Drivers - The drivers for the intraoral and/or extraoral acquisition devices that you want to use. For the complete list of acquisition devices that are supported by Dentrix Ascend Imaging, see "Supported Acquisition Devices." Acquisition agent - A small application that runs in the background and handles the communication between your acquisition devices and Dentrix Ascend. You do not need to install the acquisition agent on computers that you will be using to only view images. Notes: During the installation of the acquisition agent, a security certificate is installed automatically to allow for secure communication between the browser running Dentrix Ascend and the acquisition agent. Note: If you do not perform the necessary setup on a computer that you want to acquire images from before attempting to acquire images, when you attempt to begin acquiring images (see step 2 of "Acquiring Images"), you will be asked to perform the necessary setup and will not be allowed to proceed with the acquisition until the setup is complete. Mac users: To install the acquisition agent, please contact our support team at 1-855-232-949301634 266800. Important: Prior to installing the acquisition agent, verify that the Microsoft .NET 4.0 framework is installed. If .NET 4.0 is not installed, you must install it before you attempt to install the acquisition agent. On the welcome screen, click (or tap) Next. On the Choose Components screen, leave Acquisition Agent selected, and then click (or tap) Next. On the Choose Install Location screen, leave the default Destination Folder selected, or click (or tap) Browse to select a different location. Then, click (or tap) Install. On the completion screen, click (or tap) Finish. If you need to change the default settings of the acquisition agent (even though the defaults should suffice), after you complete the installation, right-click (or tap and hold) the Acquisition Agent icon in the notification area of the Windows task bar, and then click (or tap) Preferences. Correction File Path - For Dexis sensors, this is the default location of the calibration files (C:,Dexis,Flashdir). If the calibration files are located elsewhere, click (or tap) Browse to locate and select the correct folder. Use Binned Acquisition - In the Dexis imaging software (versions 9 and 10), "binned" is the default operating mode for Dexis sensors, so this check box is selected by default for Dentrix Ascend Imaging. Use Buffered TWAIN Transfer - This option is for TWAIN drivers and is selected by default. If there are issues with TWAIN sources delivering images properly to the acquisition agent, clear this check box to use the native transfer mode, which some TWAIN sources require or recommend. IAM Settings - Click (or tap) to configure Optime or OP30 settings. Joy Number and Use Joystick with Generic Camera - If you use a "Generic" intraoral camera with a joystick button interface instead of proprietary buttons, select the Use Joystick with Generic Camera check box. The camera button will use a specific joystick number. This is typically zero if no other joysticks are installed on the computer. Enter a number from 0 - 10 for Joy Number. If you use a Digital Doc camera, and it has been installed to use a port other than zero, you must specify the appropriate joystick number. Intraoral and Extraoral TWAIN rotation - The Acquisition Agent uses settings in an .ini file to rotate and/or flip an image from TWAIN intraoral or extraoral imaging device prior to being delivered to Dentrix Ascend Imaging. You can modify these settings to correct the rotation/orientation of images from TWAIN devices. The .ini file is located in the Acquisition Agent's folder on the computer. The .ini file lists all the TWAIN devices that have been used by Ascend's imaging. A device will be listed under the category that corresponds to the type of device that it is: PanoramicTwain (for panoramic images) or DigitalSensorTwain (for intraoral images). Refer to the examples below. Note: The acquisition agent logs actions that it performs for debugging, troubleshooting, and performance monitoring. To view the log, click (or tap) Show Log Files. Tip: To check for newer versions of the acquisition agent later on, click (or tap) the Acquisition Agent icon in the Notification Area of the Windows taskbar to view a menu, and then click (or tap) Check For Updates. 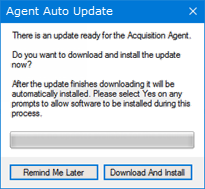 If an update is available, in the Agent Auto Update dialog box that appears, click (or tap) Download And Install. When the update is complete, on the message that appears, click (or tap) OK.